Un post un peu spécial pour référencer les quelques microcodes que j’utilise actuellement avec les téléphones Lync-Phone disponibles. La méthode pour appliquer faire la mise à jour est juste après ce listing. * 25/11/11 Mise à jour des drivers le 21 par Microsoft. 1. Télécharger le package ci-dessus dans un répertoire du serveur Front-End. 5. Maintenant il est temps de faire la mise à jour des postes, donc aller dans Clients > Test Device > New > Global Test Device et configurez une adresse MAC d’un téléphone pour test. 6. Laisser le téléphone en idle pendant 10 minutes. Il n’y a aucun moyen de réduire ce temps, donc aller prendre un long café et surtout ne touchez à rien. 7. Le téléphone redémarrera pendant la mise à jour sans perdre ses paramètres. Une fois testé et validé, revenir dans la console Lync dans Clients > Device Update, surlignez/séléctionnez la mise à jour testée et lancer Action > Approve. Les versions antérieurs seront automatiquement marquée comme « Restore Version ». Simplement pour avertir tout le monde à propos d’un possible fonctionnement « surprenant » de cette gamme: S’ils ne se mettent pas à jour du tout quoi que vous fassiez, c’est peut être parce que vous êtes sur le BIOS de secours! S’ils refusent toujours de se mettre à jour, faite 5 reset de ces postes rapidement (le reset doit avoir lieu au moment de la demande d’authentification) et ils basculeront sur l’autre BIOS. Un de ces deux BIOS est en lecture seul, donc il faut basculer vers l’autre BIOS pour que les mises à jours soient applicables. J’ai personnelement eux cette mauvaise expérience avec des postes sur le BIOS de secours au déballage. La leçon est: Appliquez toujours les mises à jour avant de poser le téléphone sur le bureau de l’utilisateur, cela vous économisera du temps et de l’énergie. A special post this time as I will update it as often as possible to add new device firmware location. How to upgrade can be found after the firmware list. 1. Download the package on the Lync Front-End. 5. 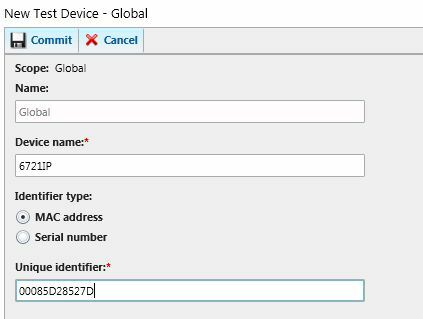 Now its time to push the update to the device, so lets go to Clients > Test Device > New > Global Test Device and configure it by MAC address. 6. Wait 10 minutes for the phone to check for update (Idle Time) or go to lunch/take a coffee.. there is no way to reduce that timer. 7. Once tested and validated, return to the Clients > Device Update, select the approved update and do Action > Approve. Previous version will automatically be changed to « Restore Version ». Just to warn everybody again about the « strange » behavior of those phones: If they don’t update at all, its maybe because you are working on the secondary BIOS chipped in those phones. When you try and fail to update those phone, just reset it five time in a row (wait for the phone to ask you about your loggin information each time) and it will change the active BIOS. One of the two BIOS can’t be updated, and sometime the phone is delivered at your office with this firmware « active ». So update the phone before putting them on the end user desk, it will save you many time. Each time you want to replace a PBX by Lync, you have to be clear about what you can do and what you will have to « work around ». So here is a short list of feature supported (or not) by Lync. AUTOMATIC CALLBACK No* Equivalent functionality is achieved via presence state tagging. The calling party is alerted when the called party’s presencestate changes from “On a Call” to any other state, and may then call or contact the called party via IM other means. AUTOMATIC INTERCOM No* Instant Messaging may be used to send non-obtrusive, immediate messages to all users logged into Lync, both at and away from their desk phones. In addition, third party analog overhead paging system may be used. INTERNAL & EXTERNAL CALL PROGRAMMING Yes Via Exchange 2010 personal auto attendant. TIME OF DAY/DAY OF WEEK CALL PROGRAMMING Yes Via Exchange 2010 personal auto attendant. ANI/DNIS/CLID CALL PROGRAMMING Yes Via Exchange 2010 personal auto attendant. INTERNAL CALLER ID PROGRAMMING Yes Via Exchange 2010 personal auto attendant. CALL FORWARDING – FOLLOW-ME Yes Simul-ring may be set from Lync, browser (using Communicator Web Access), or from a Windows Phone. CALL PICKUP – GROUP Yes Via Team Call. CONSECUTIVE SPEED DIALING Yes This is possible using normalization rules, but not recommended. Identity-based dialing using contact lists and corporate GAL search simplifies reaching any contact. CUSTOMER STATION REARRANGEMENT Yes No administrative action is required. Users may either physically move their endpoint or login to a different endpoint. DISCRETE CALL OBSERVING No* Not provide by Lync Server, but can be added with third party contact center solution. EMERGENCY ACCESS TO ATTENDANT No* A specific emergency access key is not provided, but users may call any Attendant or other user and specify high priority. Audio and visual call indications are given. GROUP LISTENING No* Users may take advantage of built-in recording to enable post-call group listening, or may create an ad hoc conference to enable real time listening. INTERCOM DIAL No* IM may be used in place of intercom functions to reach users both at and away from their desktop phones. LOUDSPEAKER PAGING ACCESS Yes This can be done via integration of third party (e.g., Valcom) paging system as an analog device. MANUAL INTERCOM No* IM may be used in place of intercom functions to reach users both at and away from their desktop phones. PAGING/CODE CALL ACCESS Yes This can be done through third party paging hardware. PERSONAL SPEED DIALING Yes Via Contact lists. PERSONALIZED RINGING Yes Users can specify ringing patterns for their own Lync Client. PRIVACY – ATTENDANT LOCKOUT N/A Multi-party connections are not held on the Attendant console, and therefore lockout is not necessary. PRIVACY – MANUAL EXCLUSION N/A Multi-line appearance functionality is provided for incoming calls via the Team Call and Delegation capabilities, but does not allow users to seize in process calls. SECONDARY EXTENSION FEATURE ACTIVATION Yes Planned to be available via Resource Kit. SILENT MONITORING No* Built-in conferencing capability plus mute mode may be used to enable supervisor monitoring. Integrated third party contact center solutions can provide full capability. STEP CALL No* Presence indicators allow attendants and other station users to determine that a particular station user is busy before dialing, and to instead choose an available station user. TEXT MESSAGES Yes Via PC or mobile phone interface. WHISPER PAGE No* Instant messaging may be used instead. In addition, integrated third party contact center solutions can provide full capability. AUTO-START/DON’T SPLIT N/A Attendants do not use a console dial pad to activate calls, but instead use a GUI interface on the PC. BUSY VERIFICATION OF TERMINALS/TRUNKS No* User terminal status may be determined via Presence. Trunk status is reported via System Center Operations Manager or other monitoring tool. CAMP-ON N/A CAMP-ON is not required for Attendants as calls may be presented for disposition even to called parties currently on a call (there is no concept of “lines” to limit how many active and on hold calls a given user may have). If the Attendant requires greater control of the call, presence state tagging may be used to alert the Attendant when the presence state of the called party changes (from “In a Call” to any other value). CONTROL OF TRUNK GROUP ACCESS No* Trunk group access may be restricted based on administrator controlled dialing rules, but not via the Attendant. DELAY ANNOUNCEMENT Yes Call forwarding settings or Response Group timeout may be used to direct delayed callers to the SIP URI of a Response Group queue with a delay announcement. DIRECT TRUNK GROUP SELECTION No* Trunk group selection is controlled by administrator defined routes, not the Attendant. INTERPOSITION CALL & TRANSFER Yes Calls are not held on the Attendant, but can be transferred back to the Attendant for additional routing. INTRUSION (BARGE-IN) No IM may be used instead of audio intrusion. OVERRIDE OF DIVERSION FEATURES No* Attendants cannot override diversion features set by users. PRIORITY QUEUE Yes Response Group functionality may be used to implement priority queues. RECALL Yes Calls are not held on the console, but Attendants may be recalled at any time. TRUNK GROUP BUSY/WARNING INDICATOR No* Monitoring and warning indicators are provided by System Center Operations Manager and other tools and handled by administrators rather than Attendants. TRUNK ID No* Gateway or SIP trunk ID may be captured in call records, but is not visible to Attendants. ADMINISTERED CONNECTIONS N/A Administered connections are typically used for connectivity of data endpoints over ISDN DS1 or other circuits. Office Communications Server does not control data networking. ANSWER DETECTION Yes Network answer supervision is generally used to ensure the accuracy of call duration information. The use of DSP-based answer detection to accurately reflect duration for calls that do not receive network answer supervision is gateway dependent. AUTHORIZATION CODES N/A Lync Server relies on identity based authorization, and allows users to login to any IP terminal based on their identity. This eliminates the need for DTMF based authorization codes for most customers. If required, third party solutions available from Enabling Technologies and others enable DTMF-based authorization codes. AUTOMATIC CAMP-ON N/A An incoming DID call is presented to the user for disposition regardless of whether the user is currently on a call. (There is no concept of a “line” to limit the number of active and on hold calls for a given user.) Users may disposition the incoming call in the most appropriate matter: by answering (existing call is automatically placed on hold) or by redirecting to voice mail. AUTOMATIC CIRCUIT ASSURANCE Yes Via SCOM alerts and reports based on Monitoring server thresholds at a gateway level. AUTOMATIC NUMBER ID Yes Reverse number lookup and Calling Party Name Display are supported. AUTOMATIC RECALL Yes Via safe transfer capability. AUTOMATIC TRANSMISSION MEASUREMENT SYSTEM Yes Via SCOM alerts and reports based on Monitoring server thresholds at a gateway level. CALL LOG Yes Via Recent Contacts in Lync and Conversation History in Office Outlook. CLASSES OF RESTRICTION (SPECIFY #) Yes Via policy and user routing profiles with no practical limit. CLASSES OF SERVICE (SPECIFY #) Yes Via policy and user routing profiles with no practical limit. CONTROLLED PRIVATE CALLS No* Controlled Private Call functionality is not natively provided, but could be added via combination of routing rules and third party IVR solution. DELAYED RINGING Yes Via dialed user call forwarding settings. DIRECT DEPARTMENT CALLING Yes Via Response Group with parallel routing or via Team Call. FACILITY TEST CALLS Yes Scheduled synthetic transactions may be used to test operations at an Lync Server pool level, and administrators may also perform manual facility test calls. FORCED ENTRY ACCOUNT CODES No* May be done using third party add-on. HUNTING Yes Via Response Groups. LEAST COST ROUTING (Tariff-based, TOD/DOW) Yes Tariff-based routing is under control of administrator. TOD and DOW are not supported. NIGHT SERVICE -FIXED Yes Via use of Response Group front-end to Attendants with after-hours routing to Night Service Response Group. NIGHT SERVICE – PROGRAMMABLE Yes Via use of after-hours forwarding on Attendant Console. OFF-PREMISES STATION (OPX) Yes* Via Edge Server and Internet connection. OPEN SYSTEM SPEED DIAL Yes* May be done via call normalization rules, but identity based dialing, contact lists, and corporate directory search are recommended instead. RESTRICTION FEATURES: Via user policy and routes. ROUTE ADVANCE Yes* Automatic selection of alternate facilities occurs for all calls. SECURITY VIOLATION NOTIFICATION Yes Via PC-based security policy enforcement. SNMP SUPPORT Yes* System Center Operations Manager can generate alerts based on SNMP traps from third party equipment. SYSTEM SPEED DIAL Yes Administrators may use dial plan normalization rules to define speed dial codes, and users may also dial by name. The latter is the recommended approach. TIMED REMINDER Yes The developer interfaces enable the system to be programmed to automatically contact users at specified times, and to take a variety of actions including but not limited to playing a recorded announcement or music. TRUNK ANSWER ANY STATION Yes Yes, via Night Service Response Group configured to ring all stations. UNIFORM CALL DISTRIBUTION Yes Via Response Groups. VIRTUAL EXTENSION Yes* Lync Server does not require virtual extensions for secondary extensions on voice terminals since there is no limit to the number of active and on hold calls for a given user or terminal. However, Response Groups effectively present “virtual extensions” in the form of SIP URIs and (optional) DID numbers. Those informations were posted on march 2010, some more features may be now available.